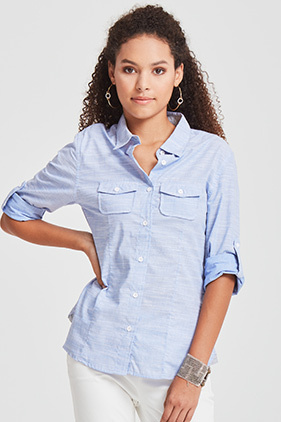 55% cotton/45% polyester 3.3 ounce ladies long sleeve woven textured shirt. Two chest pockets with button flap closure. Roll-up button sleeves. Front vertical stitching. Back stitched yoke. Blue and red have black inner collar. Bottom hem.